Headroom show returns to Metropolis in March | What Hi-Fi? The popular Headroom show, London's leading headphone and portable audio event, will take place at Metropolis Studios on 24th-25th March. 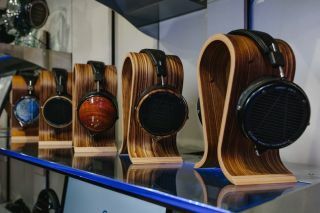 Headroom, now in its third year, is organised by headphone retailer audiosanctuary.co.uk and showcases the latest portable audio technology as well as allowing visitors to try out a huge number of headphones, from portable in-ears to high-end hi-fi models. Metropolis’ CEO Ian Brenchley says: “We love hosting headroom here at Metropolis. Not only do we, as members of the music industry, get excited about seeing all the latest innovations unveiled inside the studio, we love inviting audiophiles in from all over the world to see and sample the brilliant range of gear on offer at the show." Visitors will also have the chance to look around the world-famous Metropolis Studios, where artists such as Adele, U2 and Michael Jackson have recorded albums. Tickets are available from £10 (for one day) from the Headroom website.